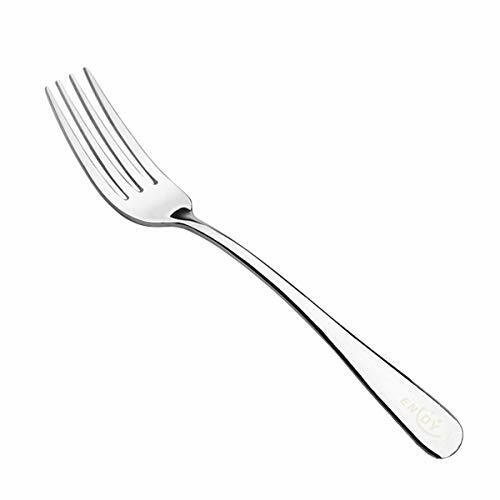 ENLOY dinner fork is perfect for everyday use as well as formal catered events with its simple elegance design. The stainless steel dinner forks allow you and your family or friend to enjoy every bite. Made of high quality stainless steel, The ENLOY dinner forks are Sturdy, Healthy , Corrosion-resistant, Tarnish resistant. The fork tines are polished carefully and smooth, pointy but not sharp. The dinner forks feature a rounded and smooth edge for safety and avoiding hurting hands. A classic and simple design allows you for mixing and matching with your existing flatware. 12- piece dinner forks will serve as a good replacement in the kitchen. Use for steak and potatoes, fresh fish and steamed vegetables, lasagna, pasta dishes, spaghetti, salad and other food. These forks are perfect for every day dining, gathering, parties, camping. 【High quality& Durable】ENLOY dinner forks are made of high quality stainless steel.These dinner forks are solid, healthy,corrosion-resistant, rust-resistant, no smell, anti-oxidant. Ensure you enjoy every bite securely. Easy to clean without Food residues on the forks, the table forks enable you enjoy a good meal with your family at home. 【Safety & Reliability】 The four tines of the forks are polished carefully and smooth, pointy but not sharp. The ENLOY dinner forks are enough to fork food without hurting your mouth. The dinner forks feature a rounded and smooth edge for safety and avoiding hurting hands. The dinner forks have a comfortable and modern design. The Round Handle end is comfortable to hold and labor-saving. 【 Elegant Design】 The ENLOY dinner forks have a classic and simple design for mixing and matching with your existing flatware easily. The elegant dinner forks are visually pleasing with a mirror finish design. Add simple elegance to your table settings. 【Replacement & Gift】 The 12-piece dinner forks will meet your demand for a big family reunion or holiday party. They may serve as a good replacement in kitchen. Have a wonderful dinner with your family for promoting family fun and unity. Share some delicious food with your friends for promoting friendship. The ENLOY dinner forks will also be a excellent gift for your family and friends. 【Multi-function】ENLOY dinner forks are use for serving steak and potatoes, fresh fish and steamed vegetables, lasagna, pasta dishes, spaghetti, salad and other main course. These dinner forks are perfect for every day dining, gathering, parties, camping. If you have any questions about this product by ENLOY, contact us by completing and submitting the form below. If you are looking for a specif part number, please include it with your message.